The cliché with simulators is they are all the same; inaccurate, unrealistic, and not intuitive. After 12 years of intensive research and use of simulators, I figured out a way to address the faults of so many before me. Realistic feel is one of the most important aspects of a simulator. The player should be able to play or practice inside, and apply the same feeling to an outside course without a problem. This is why our simulator uses patented hitting areas that give you realistic feel. In addition, one would get results on the fairway, rough, and sand; by going from the inside to outside it makes it practically seamless. It also reduces risk of joint pain and injury. Our simulator has many user-controlled options. For example, weather, zooming up on landing areas, distance controls for practice and driving range, and chipping and putting modes are included. The player can even chose different playing formats, camera angles, and instant replays, so you can relive that awesome shot. Another improvement made is the overall look and function of the simulator. We have a HD 14 1/2 foot wide screen, allowing the golfer to feel more like they are out on one of the 80 tour quality courses available on the simulator. Choose from Oakmont, Bay Hill, Latrobe, St. Andrew, Pebble Beach, and many more. Everyone hits from the center for better alignment and no switching between the right and left handed golfers. Furthermore, our simulator has a tapered roof design. Golfers can hit any sort of high flop shot, and it will register. Next most simulators use their own “special” proprietary tracking system. Unfortunately, they don’t use their tracking system for anything outside of the simulator. Interestingly, most pros that own these simulators use some other form of ball tracking launch monitor when they claim their simulator is accurate. The Inner Quest Golf simulator uses the same ball tracking launch monitor that the pros are using for their golf club fitting and TV uses to trace to ball during tournaments. The Flightscope launch monitor gives the amateur golfer and pro alike all the info they need to improve their game and club fitting. For example, launch angle, ball speed, back & side spin, club speed, carry and total distances, dispersion and deviation from target, and the ability to find clusters and shot patterns. Want to play a round on an Inner Quest simulator or join a league? 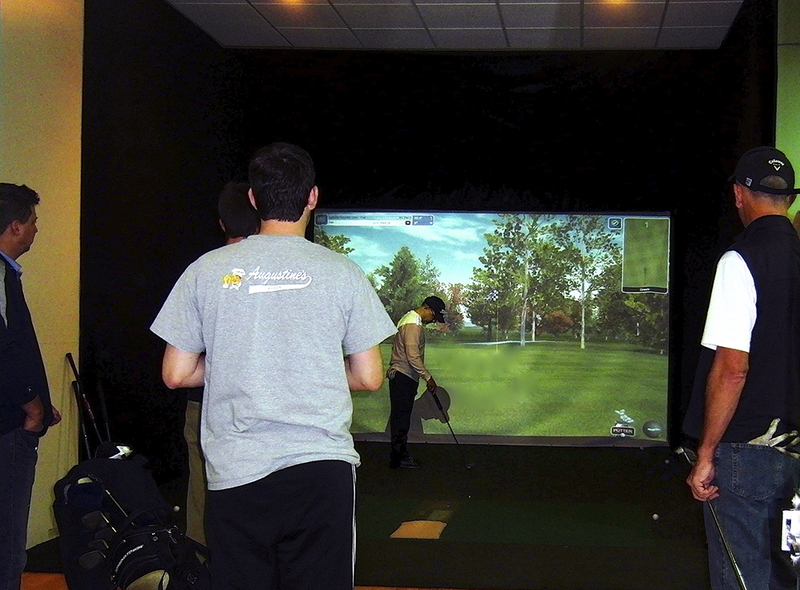 Contact us today to book a tee time on our exclusive Inner Quest Golf simulator.